ABC's of School Psychology: Happy School Psychology Awareness Week! Happy School Psychology Awareness Week! Each year for a week in November, school psychologists and the services that they can provide are in the spotlight. This year, NASP’s theme is “We’re all in! 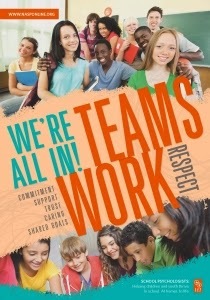 Teams work!” In order to succeed in school and life, students, parents, and staff must often work as part of a team. The idea behind this year’s theme is to help students and school staff identify, implement, and enhance team related skills with a strengths-based focus. Visit the link below for more information and to obtain resources for your school to spread the message! I also included a link below with information about coordinating a strong school psychologist team. A strong and effective team of school psychologists either within or between school districts helps to ensure continuing professional learning and problem-solving support for all school psychologists involved. In turn, each school psychologist will be better able to serve the needs of his or her school population. The walk was a success!